My front door is my favorite thing about my house. 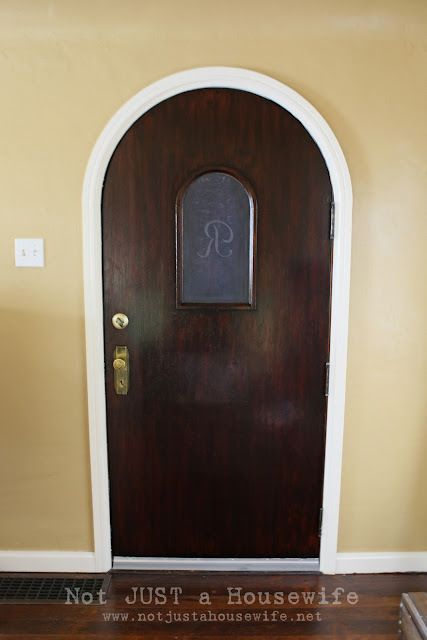 I LOVE that it is the original door to my 1938 home and I LOVE that it is rounded. I love that it is solid wood. Thick and strong. But I did NOT love the orange color of the wood. I held off on doing anything at first because I didn’t want to take it down and have to sand it clear down to the bare wood. And then after awhile I just got so use to looking at it that I forgot it was orange. 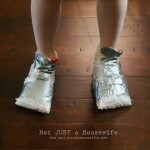 Well, Better Homes and Gardens coming to my house changed things! I suddenly saw my house with new eyes and I realized the orange had to go. Somewhere along the time when we bought our house and now, I found out about Gel Stain. You don’t have to sand it completely down to the bare wood. In fact, you don’t have to sand at all! 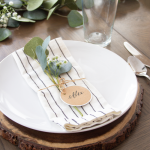 I am planning on writing a whole post devoted to staining but until then you can see my clip from Good Things Utah HERE. And here you go!!! No more orange :) I love the dark rich walnut. They have 10 different colors in Gel stain. You certainly don’t have to use a color this dark. I sealed the inside using polyurethane and the outside of the door using Helmsman. Do you know what else I LOVE about my front door??? I have the original key! And it works!!! I framed it and put it on my side table in my front room. 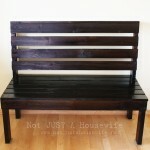 I can't wait for your post on staining. I need to strip and stain my front door. I LOVE that dark color!! 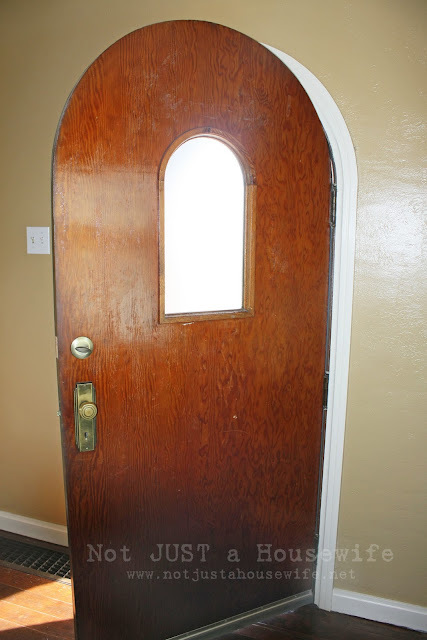 Thanks for the inspiration….I too have a similar door but with original inlaid carvings of hearts & flowers! Yours looks great! What!? No sanding?! It looks fantabulous! Your door is beautiful! and no sanding? How cool is that!? What a luscious-looking front door! That dark stain really makes it POP. Wow,…what a transformation. I love the new colour. It goes so well with your other wood tones and the brick. Gorgeous!! Amazing door … I love that it's round. The new paint job looks fantastic. Love what you did with the window and I LOVE that you have the original key! I love the door! I wish I had a cool amazing wood front door, but it's the standard run-of-the-mill metal door. Would gel stain stick to metal? Okay, I just went and looked again at the gel stain can and it says right on there, "for metal". Doh….my bad! But, that's good news! 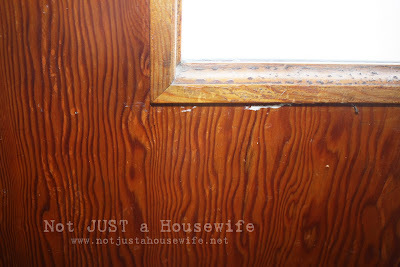 I want to do my cabinets – this gel stain could be a dream come true- really, no sanding?? Do you wipe the stain off after you apply it?? I see this in my future! LOVE it! Your new door looks gorgeous! I dig the rounded look…too cool. Definately the right color if you ask me!!! I love dark wood, & that door looks gorgeous! Your front door is Beautiful! Thanks for Gel stain tip! Amazing, I love the key framed, we have an old key and we want to do something like that with it. 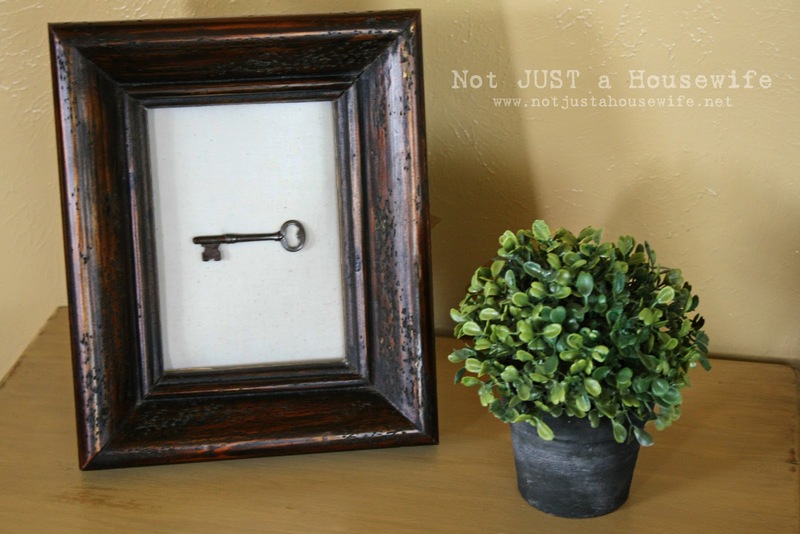 AMAZING transformation and I love the framed key — such a nice touch! Wow! Love the new color! And I love that you didn't have to sand it down to get it there. Thanks for sharing. Wow, what a beautiful "new" door! Love the stain color you chose, and really love the framed key! thanks for sharing. What a difference! I love the darker color. Where did you find the key? That's very cool. You did a great job on your front door. May only nice people enter! What a fantastic change… it's amazing what a little stain can do to transform an object. 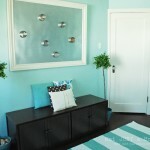 Love that you framed the key too – great touch! it is beautitful and i love that you have the key and it still works! Great job!! And that framed key is just adorable!! I'd love for you to link up to Wow Me Wednesday!! 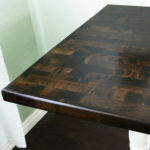 I want to do my kitchen table… would this stain work and whats the best way to do the chairs? I love your door… I have always wanted a rounded front door! I really love front doors. I think that they can be so beautiful. I love the shape of yours, and your new added touches are great!!! Thanks for sharing with the world. Looks wonderful major difference! I love it! That's awesome! 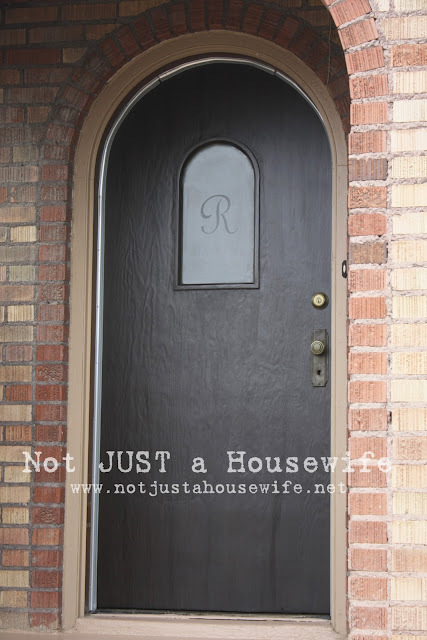 I want our front door to be black, but the thought of sanding all those nooks and crannies (shudder)…. Oh my stars… I want a front door that looks like that. 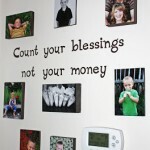 Seriously, I would buy the house just for that!! AWESOME. I have always had a secret wish for a rounded front door. The stain was just what it needed. Much better! I love the shape of the door. wow, looks great! and I love that you framed the key! Your door looks so good now. And the bonus? That key! Looks great! love the color you picked! gave it a thumbs up! sorry I missed this one earlier. with links in 5 different emails, I lost track of what ones i had and had not Stumbled yet. hopefully this next week we’ll be a little more organized! What a beautiful change, I would love to hear more about that project, I have several wood things I am thinking of changing up but staining has always seemed a little scary to me! I have a question I hope you have time to help me with. 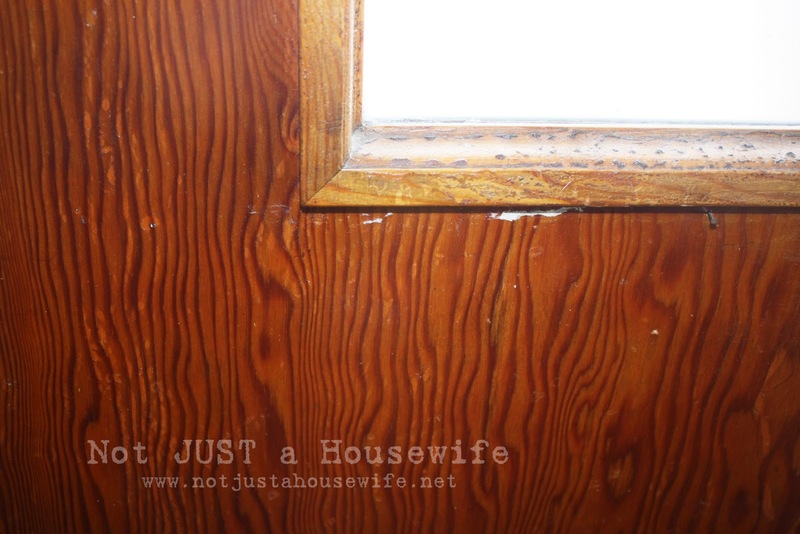 I have been thinking about restaining our sun bleached front door and your website has inspired me to go ahead with this (that clicking noise is me chewing my nails off at the thought of this). Here is my question, I’ve decided to use the gel stain. If I choose not to sand my door 1st should I still use a pre-conditioner? I want an easy way to sand my white kitchen cabinets down and stain them a dark stain. Any suggestions? It took me an hour to sand one door. At that rate I’ll never get it done. Hey:) You are amazing! I am doing my front door with the same product and wondering why u had to use a different protective layer on the outside?